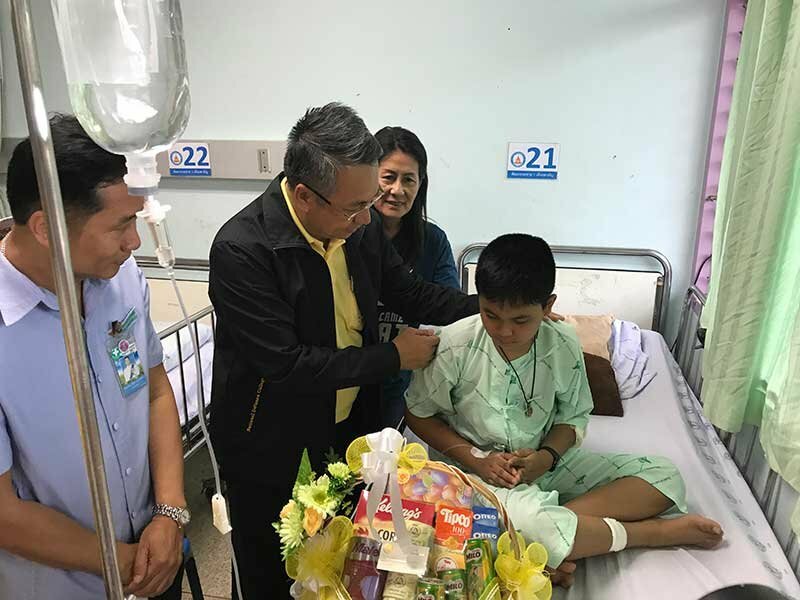 SURAT THANI, 11th July 2018 (NNT) - The Governor of Surat Thani, Witchawut Chinto, visited 19 students, aged between six and 11 years old, who were injured when their school van was hit by a car that swerved to avoid dogs fighting on the road in Na San district on Monday morning (July 9th). Fifteen of the children were being treated at Ban Na San Hospital in the southern province. Four others were referred to Surat Thani Hospital for treatment of head injuries. According to police, Wararee Thanyalaksanakul, aged 24, was driving a black Nissan March out of Na San municipality. She later swerved to avoid some dogs that were fighting in the middle of the four-lane road. The car then collided head-on with the blue school van, causing the van to overturn. The two vehicles, both registered in Bangkok, suffered major damage. The van driver, Sathit Ketnarai, 49, was taking the children from Wiang Sa district and outer areas of Na San district to schools in Na San municipality. after the cave rescue reading this kind of story is like being back to work after a two week vacation. So, what is best? Shall I drive straight and risk to kill the two dogs, or will it be far better with a frontal collision with a minibus that carries 19 school children? I guess only a professional working at a mental hospital can explain that to the driver. However, this is the result of placing the dogs over human lifes. I guess I will not even get a negative response from all the dog-lovers. Not even they can put 2 dogs before the safety and lifes of 19 school children. I don't think she placed dogs over humans... Just a natural reaction to swerve, avoiding what was in her direct path. never swerve for Animals i was told when i emigrated from Uk to Australia,hit a roo and unless you have a big bull bar sure your car may be badly damaged,hit a gum tree or oncoming vehicle it is generally you who will end up badly damaged or dead. Needless to say i take the same approach here,Thai dog's seem particularly stupid too me sleeping on the road,fighting, even mating on it,surprised i don't see more squashed one's. The natural reaction is to avoid hitting things, which means you also look in the direction you turn. How in the world could the fact that she didn´t manage to avoid the oncoming van be a different topic? I thought that was a reason for the accident to happen. Going from Sawang to Udon 6 months I saw 8 dead dogs along the way....Might have been the mating season..